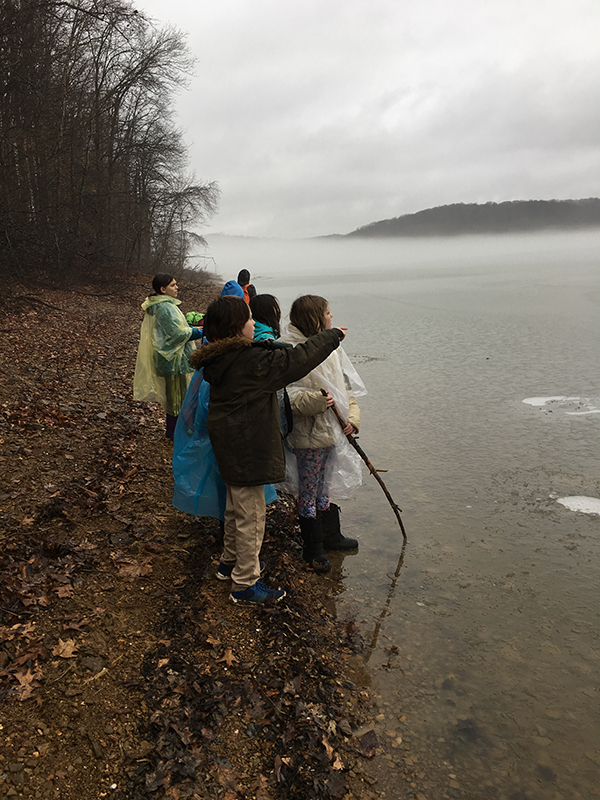 Students from the Harmony School in Bloomington enjoying a rainy day at our Amy Weingartner Branigin Peninsula Preserve. Why are our favorite memories so often about being outdoors? There’s something about playing, hiking, and relaxing in nature that refreshes us and helps prepare us for the other parts of our busy lives. Studies have found that time in nature enhances physical health, improves critical thinking skills, decreases depression, and has other lasting benefits. People who connect with nature are more motivated to protect it. For years, Sycamore volunteers led hikes and taught lessons at schools in our area, but we wanted to do even more. Our Environmental Education Program began in 2005 with Carroll Ritter as a part-time educator. Shane Gibson joined the staff in 2015 as Sycamore’s first full-time Environmental Education (EE) Director. Over the past two years, more than 9,000 people have been involved in Sycamore’s EE program through public hikes on our preserves, ongoing programs with classes from preschool through college, and programs for diverse community groups and summer camps. To ensure that our EE program continues strong forever, we established the Monarch Environmental Education Endowment in 2016, managed by the Community Foundation of Bloomington and Monroe County (CFBMC). The endowment helps Sycamore plan for the future by establishing an investment whose principal is never spent, with earnings that are used to pay EE program expenses each year. We are working hard to raise $1.3 million for the endowment so that earnings can fully cover the salary of the EE Director and some related program expenses. We are thrilled to have raised $816k, with an additional $100k pledged for this spring, and hope to reach our goal this year – and this is where you can help! To learn more or contribute to the Monarch Environmental Education Endowment, please contact me at ann@sycamorelandtrust.org or 812-336-5382 ext. 104 Thank you!